Lekan is an agricultural and rural development specialist with over 24 years of experience working with smallholder farmers across Nigeria, improving their livelihoods through capacity development in agribusiness, financial education, and agricultural production best practices. He now works with PYXERA Global as the Deputy Project Director for the YieldWise tomato value chain project in Nigeria. Prior to this engagement, he worked with Mercy Corps Nigeria as the income generation Team Lead for the Catholic Relief Services (CRS) - Feed the Future Nigeria Livelihoods project where he managed USD1m innovation fund and led private sector engagement, financial inclusion activities, and development of small rural and agricultural businesses. Lekan previously worked with Notore Chemical Industries limited, a fertilizer and agricultural input producing company as seed rice Production Manager where he developed and managed large seed rice out-grower and contract farming program. For about five years, he worked as the Agricultural and Business Development Coordinator for the UNDP/Millennium Promise/Earth Institute Millennium Villages Project (MVP) where he managed a micro-credit and financial inclusion program with a gender focus for smallholder farmers and developed a yield increase program for maize, soybean, cowpea, and tomato resulting in significant yield increases. At the MVP, he was also the Project Manager for an AGRA funded three-year soil health project. He also worked with Premier Seeds Nigeria as Senior Assistant Marketing Manager in charge of the middle belt of Nigeria. 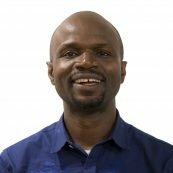 Lekan worked for 15 years with the International Institute of Tropical Agriculture (IITA) as a Senior Research Supervisor in the systems agronomy unit where he was involved in basic and adaptive research on-farm and on-station. He holds a master’s degree in agricultural extension from the Abubakar Tafawa Balewa University, Bauchi and a postgraduate diploma in business management from Herriot Watt University Edinburgh Business School, Scotland.